In the early nineties Dutch keyboardist Edo Spanninga was looking for musicians to form a progressive rockband. 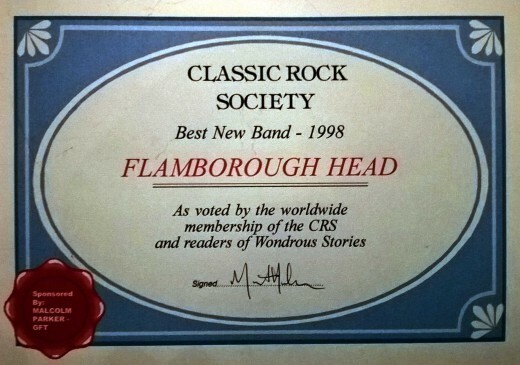 After a short search Koen Roozen (drums), Marcel Derix, (bass), Andre Cents (guitars) and Sieberein Schaaf (vocals & keys) joined the band which they named Flamborough Head. Their first effort; a cassette-demo called Bridge To The Promised Land, caught the interest of Malcolm Parker who signed the band to his Cyclops label. The first studio album Unspoken Whisper (1998) was well received; readers of Wondrous Stories – the magazine of the UK Classic Rock Society – nominated Flamborough Head as “Best New Band 1998”. After the rele ase of their second album Defining The Legacy (2000) Andre and Sieberein decided to leave the band and they were replaced by Margriet Boomsma (lead vocals & flutes and recorders) and Eddie Mulder (guitars & backing vocals). This new outfit started to work on new material which gave the band a different sound; more melodic and perhaps less neo and bombastic – even a bit folky. One For The Crow (2002) was well received and led to several gigs in The Netherlands and abroad. Flamborough Head started to organise a progressive rockfestival at the farm of drummer Koen Roozen. ProgFarm ran between 1997 and 2011; 15 editions of this highly popular event gave more than 60 progbands an opportunity to gig before a motivated crowd. One For The Crow was followed by Tales Of Imperfections (2005) and Looking for John Maddock (2009). In this period Flamborough Head gigged at several major festivals in Holland, France, Germany, Hungary, Italy, England and Mexico (Baja). The gig at the A38 in Budapest was recorded and released as Flamborough Head – Live in Budapest (2008). After the bands last release in 2009 Eddie called it a day and was succeeded by guitarist Gert Polkerman who recorded and produced Flamborough Head’s album Lost In Time (2013) – released on our new label; OSKAR from Poland. More gigs abroad (Rumania, UK, Norway, Poland, Italy) followed. Between 2014 and 2016 Marcel and Gert decided it was time to move on; on bass we welcomed back our friend Eddie Mulder and on guitar Hans Spitzen joined the band. Hans was no stranger; on earlier occasions he had helped the band out. In the autumn of 2016 this new line up will work on a new album which we hope to release somewhere next year.